Fall is a wonderful baking season filling with all the fruits and veggies that give your bake goods that fall crisp flavor and aroma. 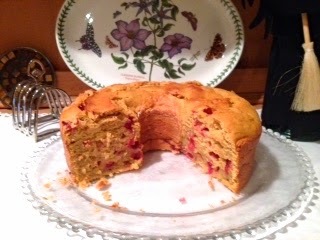 I just love this new take on pound cake adding cooked sweet potatoes and cranberries. Cream cheese make the cake very moist while the pumpkin spice adds the fall flavor. 1. Preheat oven to 350º. Beat cream cheese and butter at medium speed with a heavy-duty electric stand mixer until creamy. Gradually add sugar, beating until light and fluffy. Add eggs, 1 at a time, beating just until yellow disappears. Add sweet potatoes, and beat well. 2. Stir together flour, next 4 ingredients in a medium bowl. Gradually add flour mixture to butter mixture, beating at low speed just until blended after each addition. Stir in vanilla. Add cranberries folding over until cranberries are evenly distributed in batter. Spoon batter into a greased and floured 10-inch (12-cup) tube pan. 3. Bake at 350º for 1 hour and 5 minutes to 1 hour and 10 minutes or until a long wooden pick inserted in center comes out clean. Cool in pan on a wire rack 10 minutes. Remove from pan to wire rack, and cool completely (about 1 hour). 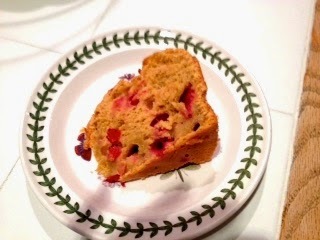 Sweet Potato Pound Cake Loaves: Prepare batter as directed; pour into 2 greased and floured 8 1/2- x 4 1/2-inch loaf pans. Bake and cool as directed.